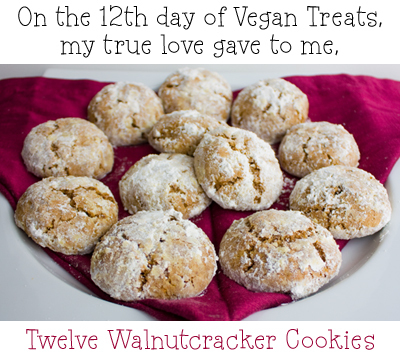 Walnutcracker Cookies: 12th Day of Vegan Treats! Act One. Walnuts. Lots of them. Walnuts are a great source of healthy fats (including those healthy omegas) and fiber. You should be able to find candied walnuts at most grocery stores. But if you can't find them simply pan toast some crushed walnut pieces in 1 Tbsp of canola oil and 1 Tbsp of maple syrup for a few minutes. Toss in a pinch of sea salt. Allow to cool before processing in food chopper. But really, the bagged candied walnuts are much easier. I used Trader Joe's brand of Candied Walnuts. Intermission. 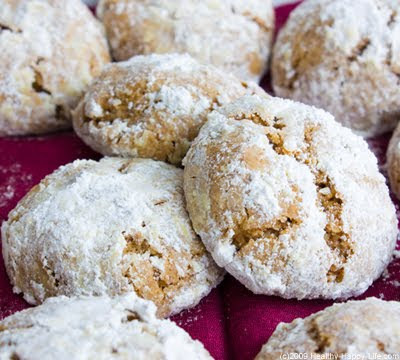 These are the perfect morning time tea cookie. 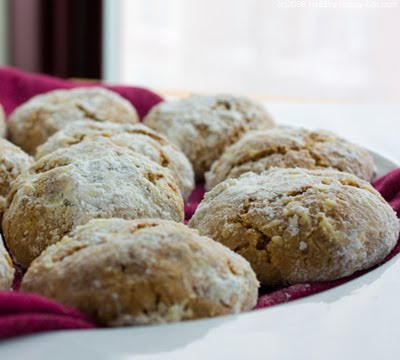 They are loaded with wake-you-up spices and the smell of cinnamon and orange zest will liven even the most groggy of eyes. 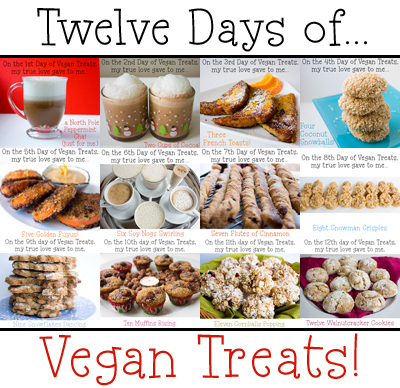 Take a break from your busy day and make these sweet vegan treats. 2. Process your 2 cups of walnuts into a fine walnut meal (using a food processor or mini food chopper). Pour raw walnut meal into a large mixing bowl. 3. Add to the large bowl: sugar, salt, baking powder, spelt flour, cinnamon, cayenne. Mix until well blended. 4. 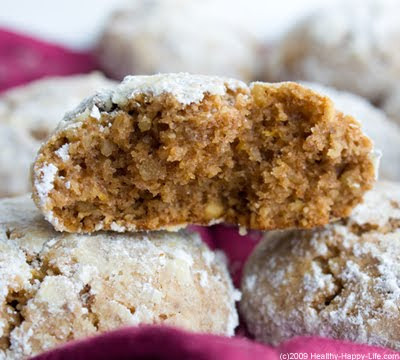 In your food processor, blend your candied walnuts into a meal. Pour into a side bowl. 5. Then add your raisins to your food processor and mince those into fine little bits. They should become a bit 'wet'. 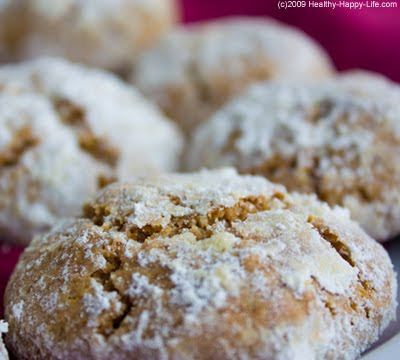 Add the minced raisins to the candied walnut meal and set aside. 6. Add your liquids to your dry mix in the large bowl: vanilla extract, apple cider vinegar, soy milk, walnut oil. Blend with a spoon until you have a nice ball of damp dough. 7. 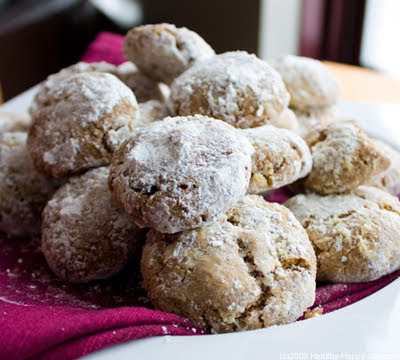 Fold in the candied walnuts and raisins mixture. Blend well. Add in a pinch of extra spelt flour if you like to handle a drier dough. 9. Prepare a lightly greased or wax-paper lined cookie sheet. 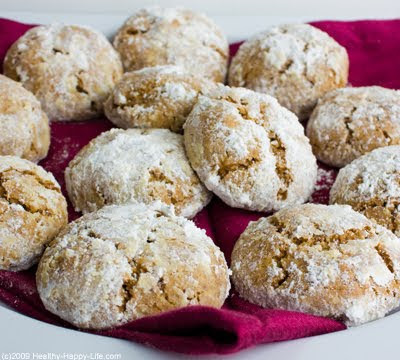 Using the palms of your hands, roll 1/2 golf ball sized sphere cookies, dunk in a bit of powdered sugar and place on the cookie sheets. Continue until all the dough is used. 10. Bake at 375 degrees for 18 minutes. 11. 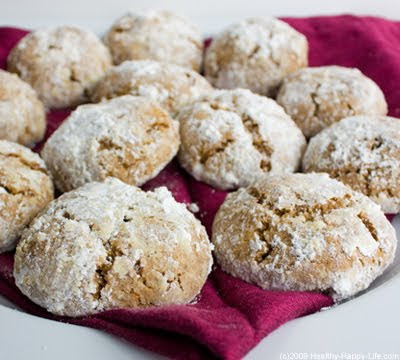 Remove sheets from oven and let cool for 1-2 minutes before dunking each warm cookie back into your powdered sugar bowl. 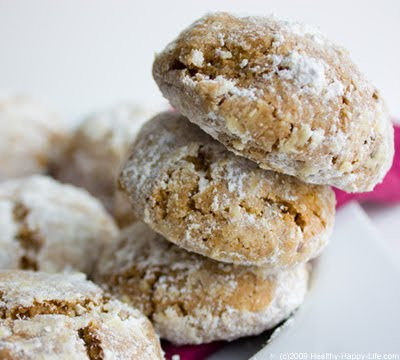 Transfer sugared cookies to a baking wrack to cool for five-ten more minutes before serving. Store in freezer or fridge for longer term eating. Store on counter for 1-2 days.